NordicTrack FreeStride Trainer FS9i Review by Industry Experts! The NordicTrack FreeStride Trainer FS9i is On Sale! The Evolution of Cross Training! Price Alert: $295 OFF the Regular Price! Our team traveled to the NordicTrack headquarters in Logan, UT. Although the winter trip was a bit shocking to our southern blood, it was worth the trip to review their FreeStride Trainer FS9i, one of the most innovative cross training machine on the market. The name best describes the type of exercise you get – FreeStride. It is ergonomically designed to move the way you do, unlike a treadmill or elliptical trainer where you are locked in a particular motion. The ability to have variable motions allows you to target more muscles and it breaks you out of the mold. When you exercise within a set pattern your body adjusts and consequently minimizes the benefits of the workout. What you want is “muscle confusion”, which is exactly what the FS9i does, confuses your muscles. MID-WEEK SALE ENDS THURSDAY: The NordicTrack FreeStride Trainer FS9i is reduced to $2,499 with Free Shipping. An Excellent Value at this price. Financing is available. $295 OFF the Regular Price! Read about the FreeStride Trainer FS9i vs. the FreeStride Trainer FS7i here. You get a stair climbing motion, a smooth elliptical stride and the ability to simulate running on air. In addition, the FreeStride Trainer FS9i has a stride length up to 32”. So users can extend their stride length to what feels natural. Furthermore, the ability to define your motion and stride length is ideal for accommodating users of different heights. 10% Incline – 10% Decline — To enhance your workout the FreeStride Trainer FS9i allows you to incline and decline the motion. You can simulate going up and down hills, and in the process you further target additional leg muscles and get a more intense cardio workout. Upper Body Workout — Like an elliptical trainer, the FreeStride Trainer FS9i comes with moving upper body handle bars, which allows you to target upper body muscles. We found it most advantageous to alternate resistance training between the upper and lower body. 20 Lbs. Flywheel — Similar to an elliptical trainer the FreeStride Trainer utilizes a flywheel. The heavy flywheel gives the motion a smooth and natural feel. 10” Smart HD Touchscreen — The display gives you colorful feedback on your workout stats and connects to iFit Live. Define goals like lose weight or train for a race and iFit Live will create a workout routine over a period of time to assist you in reaching those goals. The workouts are progressive and include motivational audio coaching. Track you stats. iFit Coach has one of the most robust tracking interfaces. It gives you a clear picture on your progress towards your goals. Simulate exercising outdoors with Google Maps. You can trace routes on Google maps and your FreeStride Trainer FS9i with simulate the terrain with the incline/decline feature. You can watch you progress on the display. Simulate running outdoors with interactive videos. There is a library of videos shot at famous National Parks and cityscapes. The videos are synced to your FS9i so that they progress with the intensity of your workout. Custom Meal Recommendations – Provides recommendations for custom meals based on your calorie burn. Get expert advice for better sleep. Note: At the time of this posting, the FS9i comes with a FREE 1-year iFit Membership with your initial purchase. This is a great value! Warranty — You get a fairly standard coverage that includes lifetime frame, 5-years parts and 2-year labor. Easy Assembly — We have not assembled a FreeStride Trainer, but from what we tell, it is considerably easier to assemble than your typical elliptical or treadmill. They can often take several hours and two people to assemble. See a comparison chart of all NordicTrack Elliptical trainers here. When you first get on the FreeStride Trainer FS9i, it is rather awkward because you are defining the motion. However, once you get the hang of it, it is a rush. You will find similar commercial versions of the FS9i in health clubs, and they are growing in popularity because of the “muscle confusion” workout that they provide. In addition to confusing your muscles, it also takes the boredom out of exercising in place. You have a variety of options that makes exercising more challenging. However, that is only part of the story of the FreeStride Trainer FS9i. The other is the numerous options and add-ons. Features like the 10” Smart HD Touchscreen, iFit Live compatibility, incline/decline capability, 38 preset programs and speakers make this a total motivational and interactive workout machine. In talking to one of the staff members at the headquarters he mentioned that the Freestride Trainers are their hottest selling items. Having experienced it personally we can see why! You may also want to check out the FreeStride Trainer FS7i to save around $1,000. The touchscreen is not as large and the FS7i does not have a decline feature. Video review taken when visiting the NordicTrack Headquarters! What is the main difference between the FS 7i and the FS 9i. I am considering one of these machines. Is the FS 9i worth the extra money? Any mechanical issues? I’m curious about the stability of FS9i machine with the 20lb flywheel. My husband and I are heavy humans and we put a lot of time on our machines. Will this wobble under the weight? I have read some reviews that state it may not be asmooth ride for heavier people. 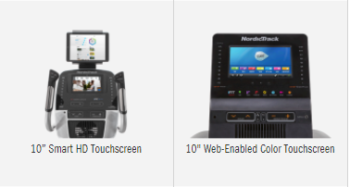 I’m trying to decide between the Proform elliptical or the FS9i by nordicTrack. I like the options the FS9i offers and the additional motions of the stepper and treadmill. Can someone assist me in providing feedback? I would love to try this out before I buy, but it seems to not be an option. Thanks for your question regarding the FS9i. It’s rated up to a 400 lb user which is more than most…but what leads me to believe it will actually support their listed user weight is the machine weight itself. It’s 331 lbs which is very heavy for a piece of equipment and a beast to try and move around. As long as you aren’t exceeding the 400 lb user weight I think you will find it to be a stable machine. 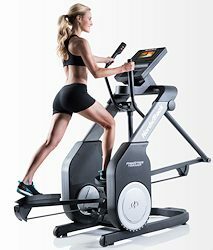 In comparison, the Proform Elliptical depending on which model would weigh much less and the user weight rating more than likely will be less. Plus there is a huge difference between the Elliptical (set pattern machine) versus the Variable stride and patter of the Freestride Trainer. Good luck!